You might be wondering why this works so well? The reason is that it encourages a synchronized rotation through the strike with almost the entire body. Everything flows through impact together. Whether you’re a teacher or a player, whether you need this or not, tuck this little nugget in your back pocket for when you or a friend find yourself in the chipping doldrums. I’m sure we’ve all at some point or another received the all-time classic chipping advice - get the ball back, weight forward and trap the ball! You won’t hear anything like that in this lesson, but you will perhaps hear and see something you haven’t caught on to before. Two of the best wedgers in recent memory have been Jose-Maria Olazabal and Brett Rumford. I’m sure you’ve heard of Ryder Cup star and Masters winner Olazabal, but you may not have heard of Rumford. The journeyman pro from Western Australia has won six times on the European Tour and has recently been battling wrist injury. Take it from me when I tell you he is as good, if not better than, anyone you’ve ever seen. While their form in the video above is not identical (whose is?) there are two important movements they both incorporate. In the backswing they both shift the pressure forward, onto the front foot and in the downswing they both elevate or stand up through the strike. Notice in the image below how Jose-Maria has moved ahead of the red line as he reaches the end of the backswing. My current opinion is that this stimulates motion (pressure shift) and encourages the chest to rotate through impact. In the following image you can clearly see how Brett has elevated from the end of his backswing into the strike relative to the red line. This is perhaps the biggest mistake I see golfers make when wedging. They attempt to “stay down” and thus limit rotation and change the radius of their strike. This can have a mortifying effect on strike quality. And we all know that strike is king when it comes to the shortgame! Be aware that these are not the only two great players that incorporate this motion - just two of the best. There you have it, two simple ideas to go and try to incorporate into your next wedge practice session. Play around, be patient and I know you’ll start to crisp up your strikes around the greens. Thanks for reading and please share with a friend in need! Whenever you struggle with chipping and pitching you’re not making solid contact with the ball. The strike is off. This could take the shape of sticking the club in the ground or completely whiffing the ground. Landing the plane is an analogy I came up with many years ago that refers to how we should get the sole of the club to interact with the ground. There should be harmony. Watch…. One of the big no-no’s I see with golfers who struggle with the club to ground interaction is this over-riding objective to STAY DOWN. Stay away from it. It will wreck your ability to repeatedly land the sole of your wedge harmoniously on the ground through impact. So many of the world’s best wedgers actually lengthen the radius of the motion by elevating in some form or another. Practice helps, but the correct concept is always the best starting point. Start with a few practice swings keeping the plane on the runway for as long as you can. Clip a few shots and then get to work on taking ownership of the motion. Thanks for reading/watching and I sincerely hope this information in some way contributes to your enjoyment of this awesome game. With the weight slightly forward and utilizing a narrow and square stance with the ball positioned centrally, be sure to keep your chest rotating through the strike in order to have the sole of the club skimming along the turf. Stay tall and keep the chest moving! As many of you know I enjoy deciphering which elements contribute to being a great wedge player. Ever since I started with my 'Wedge Project' research in 2010 chipping and pitching have really piqued my interest. My recent testing, and philosophy, has been aligned alongside golfers using one club and applying their skills to control the trajectory and outcome of their shots in close proximity to the green. For ease of illustration and testing I selected a 58º wedge and a 15 yard carry requirement. I then played three different trajectory shots - a high, mid and low shot. I recorded each version in slo-motion and at regular speed along with running TrackMan in the background to capture data on a handful of each type of shot. High: ball positioned off front big toe, face square at address and a sense that the handle slows dramatically approaching impact as the clubhead passes the handle prior to impact. Freddie Couples is a good image here. Mid: ball positioned centrally, face square at address, medium pace and a sense that the shaft will be vertical at impact. One thing that struck me was that the average ball speed was the same for each type of shot, yet the club speed was very different. The attack angle was steepest with the lower shot primarily due to the ball position and the shaft lean. I also found it interesting that there was roughly 10º difference in the launch angle of each version. The numbers might be important for coaches to understand, but what can you, the player looking to save strokes take away? Stick with one club around the greens - you'll become a skilled artisan with it in your hands. Alter the trajectory with subtle changes at address and less subtle changes in the pace. The other day during a Three Day Golf School I hit four demonstration pitch shots for my students. My intent was to repeat the same shot in each attempt, with the only difference being how I manipulated the amount of friction between the club face and the ball. The amount of loft I was able to deliver for each of the four shots was between 44.3º and 45.3º - the best I've been able to do! The interesting part is that the launch angles ranged from 30.4º tall the way up to 40.0º. How does that happen? The reasons why the launch angles are different is something that too few golfers (and coaches) understand and while I've written on this before it's a mission of mine to get the good word out. My intent was to carry each shot 50 yards and they are all played in the same fashion, with the same club except for shot 4. I must mention that in order to 'manage' the friction between the club face and the ball each of these shots is played off a tee so as to eliminate grass and outside matter from interfering. While the loft is maintained the launch, spin rate and peak height can be greatly influenced by the amount of friction generated between the club face and the ball. The moral of the story here is that the best pitchers in the world hit low launching, high spinning shots when the conditions allow. There is more at play than simply the loft at impact determining the launch angle. As you can tell friction plays a massive role too. It is my hope that in understanding this you will be less likely to try and 'fix' something that isn't broken. Hope this helps and thanks for reading! The loft on the clubface at impact is largely responsible for the launch of the ball. When it comes to wedge play friction also plays a significant role in determining the launch angle, but the purpose of this article is to share an idea to help you improve the loft you deliver to the ball at impact. Most of us will either hit the ball overly high or too low. This video illustrates a simple drill to get you to feel what you need to feel in order to grasp what is required to deliver either more, or less, loft. It’s never easy making changes as they always feel so uncomfortable. Let’s get away from associating discomfort with ‘wrong’ as you work towards improvement. I know this exercise seems like it’s the opposite of what it should be, but as the task becomes more challenging (which this one is) we have no choice but to adapt. The good news is that this drill applies directly to your long game too, so don’t be afraid to incorporate a few of these drills with those full swings too. Thanks for checking in and I hope this helps you to enjoy your golf a little more. My hope is that these drills will help to upgrade your technique, develop your skill around the greens and ultimately help you become a more well-rounded golfer. Thanks for reading/watching and if you enjoyed this article please share it with a friend who you feel might benefit. Feet should be close together. The most common mistake I see is a stance that's too wide. Alignment should be square. Yes, square. Ball position is centered to slightly forward. Weight distribution is slightly favoring the front foot. Wrists should be relatively quiet in the backswing. Avoid excessive cupping in the lead wrist. The left wrist for you righties out there. Keep the chest rotating through the strike in order to shallow the attack angle. Extend the lead side through impact. Avoid thoughts of "stay down", "hit down" or "pinch the ball". As you work towards better technique be aware that your results are not going to transition from bad to good instantaneously. Taking ownership of the upgrades will take time and patience. Get the set up correct, use the wrists properly and shallow the angle of attack with good chest rotation. Now we're talking! If you'd like to learn more about improving your wedge play check out the Wedge Project. When it comes to wedge shots, spin has always been somewhat mystical. Why will one shot check like crazy while most shots seem to want to scamper well beyond the pin? This video clearly illustrates the role of water, grass, a premium golf ball and a clean clubface - the big factors that influence friction between face and ball and ultimately, spin. As a golfer you are fully responsible for how the sole of the club interacts with the ground while you are only partially responsible for how the face interacts with the golf ball. Understanding factors that serve to decrease friction will only help you from trying to fix a motion that isn't broken. The kingpin when it comes to generating spin is friction. You can have everything set up perfectly to create huge backspin, but if you don't have friction it's not going to happen. Now keep in mind friction is a big piece of the puzzle, but it's still only a piece of the puzzle. Simply put, you can elevate friction between the clubface and the cover of the ball by eliminating any matter that could possibly get trapped between the two. The questions are how do we do this and what do we have control over? The quality of the wedges we use. If you're looking to generate more spin you simply must use what I refer to as 'professional grade' wedges that are NOT an extension of your set. Play with a premium ball as it will make a tangible difference in the amount of spin you can generate. And premium is code for EXPENSIVE. Spend the money and you'll be rewarded. Replace worn out wedges and please stop using your great-grandfathers Spalding wedge - there is not a hint of a groove left. Grooves don't make as much difference as you might think (off the fairway) but remember that we're looking to increase spin here. When practicing, and especially when playing, make sure your equipment is clean and the face is dry. Moisture or what I call 'green slime' built up on the face will make it almost impossible to hit a high spin pitch. Left over sand from an earlier bunker shot has been known to increase the friction between the face and the ball. As a result I never clean my club after playing a sand shot - the next time I use that club I might need a low spinner. Don't tell anybody, but sometimes from a perfect lie in the fairway matter (moisture, grass or dirt) will still get trapped between the face and the ball. That's due to the fact that the sole of the club will almost always contact the ground before the ball (shhh!). Yes, even on those perfectly nipped ones! When the club contacts the grass it can sometimes kick up blades and that will interrupt grip between the face and the ball. Dewy mornings. If you're playing early in the AM the grass is often wet and there's nothing you can do about it. Your pitches and chips will always launch higher and spin less when water is reducing grip. Lies in the rough. Keep the ball in the fairway and you'll be able to spin it more. That's an easy one. Thanks for checking in and keep an eye out for my next episode in this series on Spinning the Wedges when I talk about Spin Loft. This free website's biggest source of support is when you decide to call to book a lesson or golf school. You can contact me HERE. If you live in another state or country please consider making a purchase HERE or HERE. It will help your game and it will help me to keep adding to this free website. Thanks again for your support! Andrew. If the toe of the putter is overly elevated, as we see above, then the effective loft on the face (and a putter always has some loft) will point left for right handers. Here's a video I made after a recent lesson that shows what to look for, the changes and how to make the necessary adjustments to set up like the pros. Spend some time with your putter in front of the mirror and you'll soon start to grasp the sense required in order to improve how you set up correctly to your putter. Thanks for reading and please post your comments below. Notice how much more the hands elevate during the stroke for the shallow version than the steep version. I've believed it worked this way for a long time, but so nice to see clearly illustrated in the images above. Thanks very much to Mark for the invite on this tip (and for doing the tidy video edits!) and to to you for watching. If you'd like to hear and learn more about my approach to chipping and pitching around the greens check out the Wedge Project. To Mill or Not to Mill? I must be honest and write that I did this test in the hopes of proving a few people wrong. Instead, I have proven myself wrong. With my research for the Wedge Project I put my "stake in the ground" on what I believed regarding milling on the clubface. All the tests I performed using TrackMan and various wedges always showed that a wedge without a milled face generated less spin (albeit slightly) than wedges with the fine "corduroy" look of milling between the grooves. I looked up a person I believe to be very knowledgeable when it comes to equipment, Tom Wishon. I read all that he had to say on the matter of grooves and surface roughness and his findings aligned with the results I was seeing in my tests. David Neville and the crew from Vokey Wedges have been kind enough to let me have access to a few test wedges. They sent me six wedges of which I chose to use three for this test. As you can see the club that had surface milling or roughness actually generated less spin - 6009 RPM to 6229 RPM. While the difference between the two is negligible and most golfers would have a hard time telling the difference between the ball flight of one versus the other (myself included), the result is significant to me in that I firmly believed the outcome would be reversed. 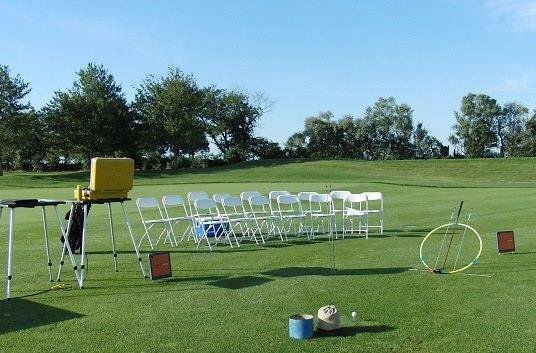 Keep in mind this is a test involving one golfer hitting a limited number of shots to one distance. The results might be a slightly different with multiple golfers at different distances, but I don't believe different enough to sway the outcome of this test. I recently posted this quote by Martin Palmer on Twitter: "The secret to mastery in any field is to forever be a student." Today my "stake in the sand" moved - I was a student and I learned something. I think it is vital as a coach, or even as a golfer, to place your "stake in the sand" and firmly believe in a method, approach or theory. Stand by it and argue in its favor. That is, until you uncover sound evidence or reasoning against your viewpoint - then you pick up your stake, admit you were wrong and adjust your approach. As you can see this clubface with both grooves and surface roughness generated the highest spin rates of all three clubs. This leads me to believe that grooves play a larger, more important role on cleanly struck shots than I originally thought. As I continue to learn and work towards providing my students with what I believe to be the best current information and knowledge available I know that I will continue to be wrong. The blessing is that each time I am wrong I will learn, adjust and be less wrong than I was before. 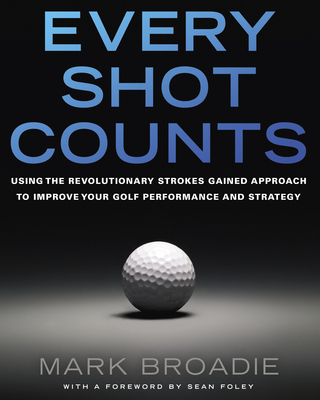 With Every Shot Counts Mark Broadie has written the most important golf book I have ever read. I say that because the book has done more to shape how I coach and deliver a golfer to their full potential than any technical manuscript before it. Mark Broadie has done an exceptional job in sifting through the mountain of Shotlink data generated by the PGA Tour over the last decade. A Columbia Business School professor and avid golfer, Broadie is widely credited with coming up with strokes gained - a measurement of how much better or worse a golfer performs off the tee or from any given distance when compared with all other PGA Tour players. The PGA Tour has been using strokes gained putting for a while now, but Broadie has also developed strokes gained driving for tee shots; strokes gained approach for shots of more than 100 yards; and strokes gained short game for shots of less than 100 yards, excluding putts. Add them together and you get total strokes gained. From 2004-12 the top 10 players in total strokes gained were: Tiger Woods, Jim Furyk, Phil Mickelson, Luke Donald, Vijay Singh, Ernie Els, Sergio Garcia, Adam Scott, Steve Stricker and Zach Johnson. A pretty impressive list and arguably the best players in the game over the last decade. The author goes on to show how these proven golfers outperformed their counterparts - "Two-thirds of the strokes they gained were from shots outside of 100 yards and one-third was from inside 100 yards," Broadie said. "Putting accounted for just 15 percent of the scoring difference between the top 10 golfers in the world and the average PGA Tour pro." Wow! I have quizzed many of my students over the past few weeks on how they would rank, in order of importance, the four primary areas that contribute to the standard of any golfer. I think one person (who had secretly read about the book and it's findings) got the order correct. Most of them had it completely backwards. It also shocked me how many ranked putting as the most important factor. To me this order is hugely important as it should influence the manner in which you go about improving. I have encouraged all my students to ramp up the amount of long iron, hybrid and driver practice they have been doing. Essentially, good golfers are good because they hit it good. The book also shows the importance of length and what an asset making the ball go a long way is. Bubba Watson has literally pummeled his competitors off the tee with brute power and speed. Now all of my competitive students work on speed sets to increase their clubhead speed as much as possible. The book is filled with valuable nuggets for both the better and weekend golfer - far too many to mention in an article like this. It includes drills for putting and even ideas on how to approach challenging tee shots dependent on your ability. If you are an avid golfer or coach and you find that your progress has plateaued, do yourself a favor and go out and buy this book and commit to reading it twice. The second time with a highlighter in hand! Here is a video I did with the help of TrackMan and a student of mine James Willis. This was actually the first time I had seen James pitch the ball and it was nice to see how quickly he hit better shots and improved the flight and spin rate of these important shots. From 60 yards and in I like to see a dynamic loft of 40 degrees, a launch angle of less than 30 degrees, a spin rate higher than 6500 rpm and a slight draw shape. The Wedge Project and a New Look! I am very excited to announce the release of The Wedge Project. It has been a long time in the making and I have learned so much more than I ever thought I would when I departed on a simple research project almost four years ago. That idea, to learn more about that low launching, high spin pitch or chip shots that golfers would sometimes hit, has opened my eyes to what I now view as the "missing link" to short game instruction. Thank you all so much for your patience as you have waited for me to get this "project" out to you. I am pleased with the product and know that everyone will benefit from the information presented. If you like/enjoy/appreciate what you see could I ask that you please share with your friends how they too might be able to purchase the video - unless of course you don't want them pitching/chipping any better. Also, I hope you enjoy the new look of Andrew Rice Golf. We would love to hear your comments, both positive and constructive. If there is anything wrong or missing please shoot me a note and I'll work to get it taken care of ASAP. Thanks again for everything - without you this site would not be possible. I was recently invited to present at the Illinois PGA Teaching and Coaching Summit alongside Stan Utley and Chuck Cook. Besides it being a tremendous privilege for me the day was both educational and entertaining. I thought it would be beneficial to relay a few of the nuggets they shared during the course of the day. lag is a major power source - use it, don't lose it! Let the putter drop and crash into the ball - I love saying it that way! I really enjoyed so much of what Stan had to say as he seemed to be a proponent of so much of what I preach in both the shortgame and putting. Get a Grip...On the Ball! What do racing tires have in common with wedge play in golf? Read on because there might be a lot more to this than you might think. On a dry, sunny day day a race car will have tires that are wide, soft and completely grooveless. The tires are wide and grooveless in order to get as much rubber in contact with the road. Any grooves simply decrease the amount of traction the tire exerts on the road. They are softer than normal tires to increase traction. In rainy conditions the drivers will switch to tires with grooves (as seen above). The grooves on the tires channel water away from the road and thus allow the flat portion of the tire to grip the road cleanly. Grooves reduce the amount of rubber in contact with the road, thus reducing traction. Club manufacturers now make their top tier wedges with a milled, legally grooved clubface. The milling on the clubface represents the softness of the racing tire as it allows the cover of the ball to settle into the mini grooves, even on these partial shots, and friction is increased. Our clubface needs grooves because we encounter many different lies during a round of golf. Many of those lies dictate that matter (grass/moisture) will be trapped between the face and the ball, greatly reducing friction. Grooves are not on the clubface for spin, but primarily as a channel to keep matter from being caught between the face and ball thus decreasing grip. Race car drivers have the luxury of changing tires for rainy conditions, while golfers do not have the luxury of changing their clubface for a variety of lies. If we hit all our pitch or partial wedge shots off a tee using a premium ball and there was no way any grass or moisture could interrupt friction I actually believe a non-grooved, yet milled clubface would actually spin the ball as much or slightly more than the current grooved clubface designs. Good luck trying to convince your playing partners to go for that idea, but isn't it helpful to know how the clubface is really designed to interact with the cover of the ball?